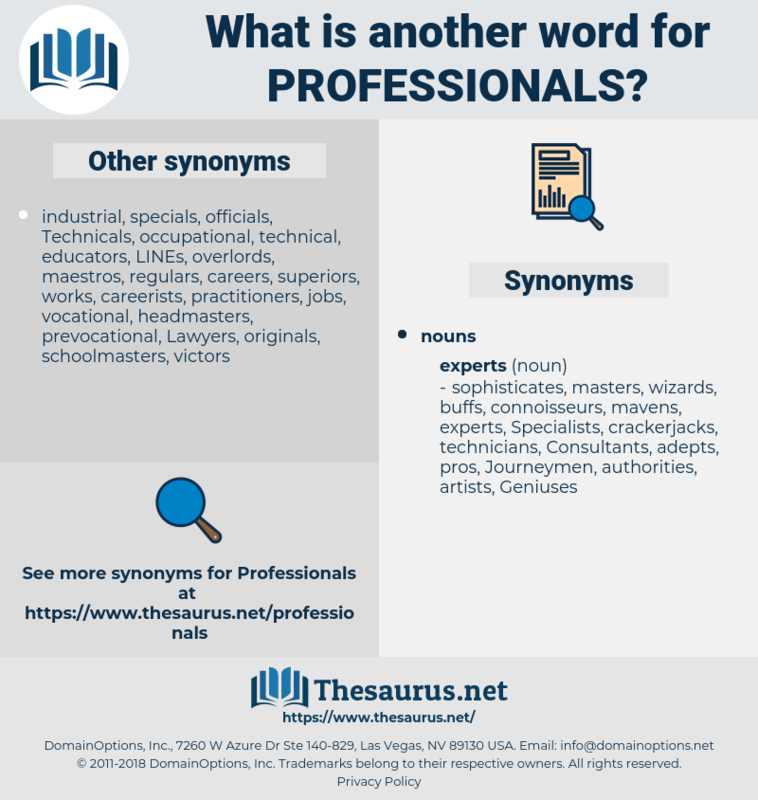 What is another word for professionals? Lawyers, Physicians, teachers, educators, doctors, professionally. specialiststos, managers, administrations, staffs, employees, people, TOS. presenters, master, officials, speakers, who, interveners, actors, measure, Environments, participants, settings, student, TOS, FORMATS, SP, extent, ex, results. pro, pros, PROFS, fields, preparers, principals, intellectuals, responsibilities, managers, historians, journalists, technologists, Soldiers, suppliers, enterprises, representatives, authorities, legislators, policymakers, planners, franchises, responsible, Personalities, industrialists, protagonists, professors, trainers, Fishermen, athletes, partnerships, defenders, manufacturers, champions, producers, Associations, vancouver, labourers, Businesses, employers, Nurses, seafarers, handlers, laborers, mental, musicians, fishers, office-holders, administrations, masters, Specialities, premises, technocrats, disciplines, explanations, Investigators, individuals, techniques, leaders, supervisors, appeals, Researchers, staffs, farmers, Guards, terms, mechanics, employees, intermediate, reports, carers, scholars, makers, politicians, regulars, scientists, economists, analysts, commentators, referees, jurists, organs, actively, writers, declarations, competitions, competitors, Recommendations, dealers, retailers, Firms, juristes, degrees, advisers, cooperation, diagnostic, boards, Companies, FAS, assistants, circles, recipients, lecturers, corps, Resources, claimants, follow-up, levels, Respondents, Functionaries, platforms, JPOS, reporters, diagnostics, projects, Vendors, Beneficiaries, games, marketers, scopes, drivers, entrants, heritage, traffickers, perpetrators, positives, merchants, domains, accountants, Undertakings, establishment, aspects, products, environment, advisors, observers, strengths, Students, counterparts, assets, assessors, Classes, institutions, stewards, Carriers, others, coaches, developments, conditions, runners, contacts, cheers, agents, tables, departments, Patients, candidates, minds, Templates, sources, monitors, Communities, forum, Forums, reviewers, elements, advantages, pictures, sites, critics, Universities, rules, contributors, members, exchanges, Craftsmen, locations, Vocations, troops, Ones, positions, buyers, structures, Children, Brains, contingent, contingents, Agencies, needs, artists, councillors, Deputies, people, colleagues, audiences, numbers, ranks, Created, redundancies, reviews, borders, unions, groups, campaigns, Towards, Boundaries, Faces, witnesses, limits, cases, ratios, works, EXS, places, Activities, pundits, contexts, TECHS, men, bundles, Forms, shows, posts, figures, guys, Territories, Bodies, women, subjects, Boxes, factions, regimes, ACCS, LINEs, presenters, officials, speakers, informants, who, interveners, panelists, actors, Environments, participants, settings, frames, FORMATS, results. 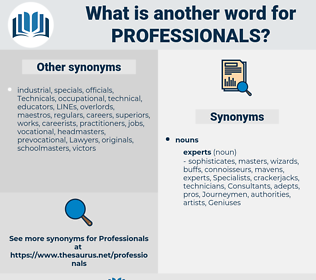 vocational, servants, responders, occupational, intervenors, informants, stakeholder, stakeholders, panellists, panelists, frames, profession, career, careers, professionnelle, specialized, technical, professionnels, specialist, Specialists. professionnelles, specializations, qualified, players, jobs, entrepreneurs, skilled, engineers, academics, qualifications, technicians, Specialties, artisans, Industries, Consultants, Talents, graduates, sector, sectors, personages, team, teams, architects, hustlers, counsellors, Caregivers, category, Categories, traders, businessmen, Constituencies, servants, responders, intervenors, stakeholders, panellists, careers, professionnels, Specialists.